Erin Kurt, B.Ed. 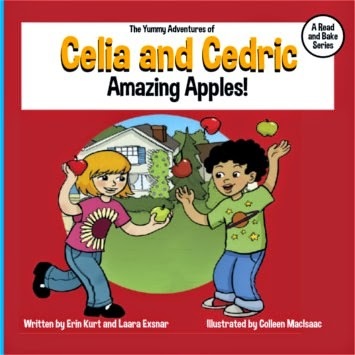 and Laara Exsnar, B.Ed, RHN are the authors of The Yummy Adventures of Celia and Cedric: A Read & Bake Series. 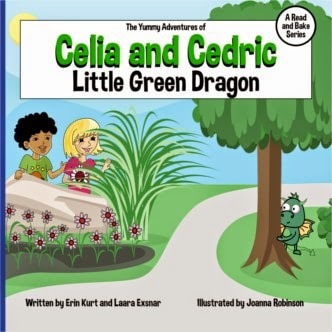 My mother and I have joined forces to write these fun, adventurous stories featuring our little characters, Celia and Cedric. Me, a former school teacher, and my mom, a retired school teacher and now nutritionist, have a passion for families, health and yummy food. We've combined our expertise and created this Read & Bake Series that we hope will bring families continuous hours of fun and enjoyment! Describe your new children’s book series in a few sentences. This NEW, unique children’s book series links adventure, positive character traits and nutritious snacks for kids. The series is called, The Yummy Adventures of Celia and Cedric: A Read & Bake Series. Our endearing characters go on fun adventures that always have them needing to make or bake a nutritious, delicious snack - which we call Nutrilicious™! The recipe for each snack is provided at the back of the book so kids can re-create the exact recipe with their moms and dads. We recommend this book series for children aged 3-8. We’ve tested the books on these ages, both boys and girls, and all just loved them! One reviewer said that these are some of the best pre-school and picture books for children she's seen in a while. And, a few school teachers have already started to use them in their classrooms. They've shared with us that the children consistently ask for our books. It just thrills us! What inspired you and co-author Laara Exsnar to write a series about characters who go on adventures and bake nutritious, delicious snacks? After I had my first child, my mother and I were sitting on the sofa chatting and she mentioned she wanted to write a cookbook for kids so she could include all the delicious and nutritious snacks she had compiled over the years. I told her that it was always my dream to write books for kids too. After chatting for a while I remembered that when I was a school teacher I used to take any book that had food within the storyline and find a recipe to match it. Then I’d turn the making of that recipe into different extension activities for the children, whether it be Math, Science or Health. At the end of the school year, my students would often mention that one of their favourite memories of our year together was the making of those yummy recipes. After remembering this, I had a light bulb moment and said, “Mom, what if we create our own children’s book series where we have two friends going on adventures and always needing to make or bake something based on that adventure. She loved the idea. Right then and there we brainstormed the adventures and matched one of her snack recipes to suit. I still have that brainstorming sheet! Each of your books includes a recipe for a snack the characters enjoy so kids can re-create the snacks with their parents. How did you come up with the recipes? Mom has literally been making and baking yummy, nutritious food since I was young. The Dirt Balls, featured in the Book Eat Dirt Balls, for instance was something she made when I was a child. Mom is a kid at heart, so she is constantly emailing me a new snack recipe she developed. In fact, just the other day I received a new cookie recipe from her! Is there a recipe that you’re particularly fond of? Well, the Dirt Balls are something I make on a regular basis, which my kids also love. However they often ask for the Green Dragon Drink and I love that as well. It makes me feel wonderful and it also comforts me when I see my kids drinking it and getting all those incredible nutrients! That being said, mom's cookie recipe, which we MUST write a future story about is my absolute favourite. I will make a quick batch of these after dinner and by bedtime they're usually all gone. They are THAT good - but also healthy! Do you have a favorite character to write? Mom's very drawn to Celia. And for some reason I'm drawn to Cedric - but both feel like our own children. We adore them! Are there any children’s book authors who have influenced your writing style? Because my specialty as a school teacher was Literacy, I read loads of books. Actually my favourite thing to do is read stories to children. So, I've been influenced by loads of authors. As well, I have seen what kinds of stories my students and children tended to request over and over again. If I had to mention a few though, I'd say, Paulette Bourgeois, writer of the Franklin series, Robert Munsch, and C.S. Lewis. Can you tell us a bit about the creative process of creating this book, from the initial idea to the finished book? Mom and I usually decide which recipe we want to focus on then we discuss what kind of situation our characters would have to be in in order to make or bake it. We go back and forth with a couple of ideas and then I usually write the story and send it to her to add her ideas. Mom has such a playful connection to kids, so she always has great ideas to add. How many books are planned in the series? How far along are you with them? We plan to write and release continuously as we have so many recipes and cute story ideas to share. Currently, we have brainstormed 20 stories, so we'll be going for a good while. We decided to launch the series with 3 books. It just didn't feel right to us, to offer 1 and then make kids wait for more. We wanted them to love the first one and have immediate access to more. These three will keep them busy for a while, but we'll soon be working on the 4th book, which we hope to release at the end of this year. We want the lives of kids and parents to be enriched by these books, so we plan to send them surprises on a consistent basis. 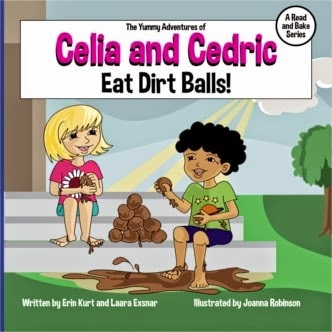 For example, we already have downloadable activity sheets on our website (http://www.celiaandcedric.com) that are based on the books. So, not only can parents and children read the books and bake together, but they can also continue bonding with these fun and educational activity sheets! Mom and I have also filmed ourselves making or baking some of the recipes and plan to do a whole lot more. My kids are excited to get in on the action too, so they want to help me make a video, and I also plan to send audios and videos of me reading the stories, since this is something I so enjoy doing. It was such a pleasure to do this interview! Thanks so much for spreading the word about these Read and Bake books we are so very proud of. Another interview with Erin and her mom coming soon to Storywraps blog....stay tune....soon! Thank you for a lovely interview---it allows folks to get to know us and our purposeful goals for kids/parents' health and happiness!